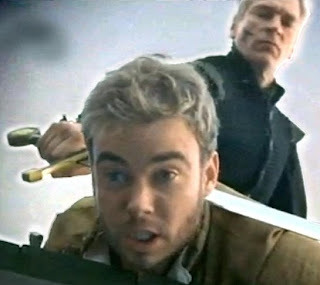 Above: Robin Hood (Robin Dunne) falls to the Sheriff of Nottingham's blade ((Julian Sands). “Beyond Sherwood Forest” was the first internet movie version of Robin Hood, made for an age when entertainment on the ‘net challenged television ratings like television once challenged the movies. Three riders charged with looking after Nottingham in King Richard’s absence, are attacked by a dragon. It slays one of the men outright, before being wounded by a second and diving into Sherwood Forest. But when the remaining two men go in search all they find slumped against a tree is a naked girl with an arrow in her side. Malcolm, the superior of the two, plunges his sword into the girl but she cannot be killed. So, realising what a powerful weapon she could prove to be in his plan to become Sheriff of Nottingham and side with Prince John against the King, he kills the other man, Loxley, and takes the girl prisoner. However, watching on from the bushes is the young boy Robert of Loxley who, seeing his father killed in this way, flees deeper into the forest. There he comes to rest before a mystical portal in the trees, leading to another world Beyond Sherwood Forest. 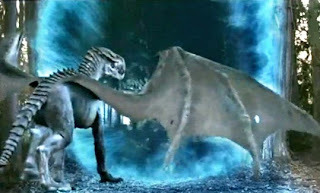 Above: Alina (Katharine Isabelle) the cursed girl who becomes a dragon when exposed to sunlight. We then fast forward several years. Marian is practising her skills with a long staff, and arguing with her father over her imminent arranged marriage to Duke Leopold of Austria. When her father refuses to see her point of view, she runs away into the forest, attempting to disguise herself as a man, only to encounter Robin Hood who demands from her some payment. In an interesting twist on the original legend, Robin and Marian fight with long staffs on the bridge whilst Little John looks on. Even when revealed as a woman, Robin Hood fails to recognise his childhood friend Marian, and she, disapproving of outlaws, decides to keep that secret from him until a time later on in the plot when she sees how he “gives to the poor”. Meanwhile, after hearing that Robin Hood has ambushed a treasure chest intended for Prince John and containing the wedding dowry, the Sheriff of Nottingham visits his “dragon girl” Alina in the dungeons deep beneath his Castle. He has something Alina desperately wants back (no spoilers here), but in order to regain it she must capture “the Man in the Hood”. Once exposed to sunlight, Alina transforms into the dragon and takes to the skies over Nottingham to complete her quest. 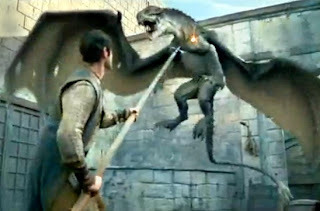 Above: Will Scarlet (Richard de Klerk) fights the dragon. Are you with me so far? It’s not as complicated as it sounds, and the next part of the film sees Robin hood and Little John joined by Will Scarlet and Friar Tuck, before finally embarking on their journey to the world Beyond Sherwood Forest; a place which holds the secret of how the dragon can be slain. This is the land of the Syrans, and the Temple of the Elders, who are the Keepers of the Trees. But to get there and find the Tree of Life, Robin Hood must ward off attacks from bats, wolves, and meet the challenge of climbing a huge rock face. Yes, you guessed it, this is the stuff of computer game plot lines as both Robin Hood and the dragon strive to reach their individual respective “prize”. One wonders if that is what is intended? Is a pc game far behind? Above: Robin Hood's first internet outlaws? 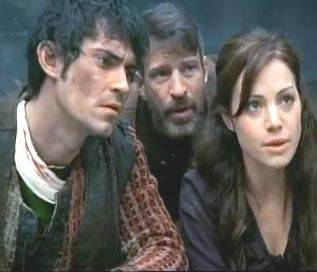 Will Scarlet (Richard de Klerk), Little John (Mark Gibbon), and Maid Marian (Erica Durance). But I found “Beyond Sherwood Forest” to be an entertaining, enjoyable adventure; one which utilises the familiar personnel as iconic heroes rather than getting too involved in character development and origins. The low budget location shooting combines very well with the special effects and the cast throughout give good performances. Special mention goes to the wonderful Katharine Isabelle, of “Ginger Snaps” fame, for her portrayal of the dragon girl Alina. Also, David Richmond-Peck for his Prince John. It’s a small part, but effective. More pictures of Alina and the dragon on THIS LINK.